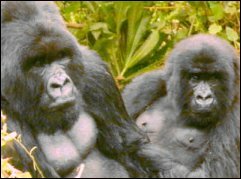 Gorillas once inhabited the entire rainforest that stretched from the coast of West Africa to the western arm of the Great Rift Valley. During the Ice Age, the climate dried out and the extensive forests receded into two pockets; the gorillas became divided into the Western and Eastern populations, which then developed into three subspecies: the Western Lowland Gorilla lives in the lowland rainforests of West Africa (Congo, Cameroon, Gabon), the Eastern Lowland Gorilla inhabits the forests of eastern Congo, and the Eastern Mountain Gorilla is found only in the Ugandan Bwindi forests and the Rwandan Virunga volcanoes. The Eastern Mountain Gorilla is one of the world's rarest animals. Only about 850 remain in the entire world, with approximately half that population in the Bwindi Impenetrable Forest in Uganda and half in the Mgahinga Gorilla National Park in Rwanda. Since these animals cannot live in captivity and there are none in zoos, the only way to see them is in their natural habitat. The Mountain Gorilla population is alarmingly small and dwindling along with their remaining habitat. To put their population in perspective - there is only one Mountain Gorilla for every ten million people on earth. Gorillas are the largest of the great apes. Genetically, humans and gorillas are very closely related - we share 97% of the same genes! The order Primates includes humans, gorillas, chimps, orangutans, monkeys, lemurs, and bushbabies. Apes differ from monkeys in being larger, having bigger brains and no tails. 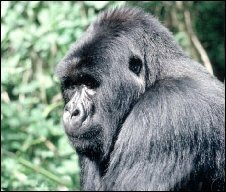 Efforts to reverse the decline in the number of gorillas date back to 1925, when Albert National Park was created by the Belgian government to help preserve their habitat. But in the 1960's several factors severely devastated the population - civil unrest, poaching, farming that devastated the forest, and colonial agricultural schemes.  The work done by George Schaller and later by Dian Fossey to educate the world on the importance of maintaining the gorilla's habitat has come a long way to help this endangered species.  The Wildlife Conservation Society of New York helped to establish the first conservation education program for Rwandans, where poaching was still a problem.  Currently, the International Gorilla Conservation Programme and several other international organizations are working to preserve the Gorilla's habitat. Before these public awareness programs, half the local farmers wanted to convert the forest to farmland - now most realize that conservation is the best strategy for the survival of this great national resource for research and tourism. Mountain Gorilla tracking is a huge attraction in East Africa - a unique experience that leads you into the gorilla's world to meet them on their own terms. The combination of international assistance, a renewed local sensitivity to the problem, the establishment of preserves, and strictly enforced rules and guidelines has raised hopes for their future. After a brief stay in the Congo, Fossey moved to Rwanda and established a research camp, Karisoke, in 1967. There, she spent years tracking Gorillas up and down the steep slopes of the Virunga Volcanoes. It wasn't until two of her beloved gorillas, Digit and Uncle Bert, were killed in 1978 that she changed from pure scientist to active conversationist, launching an often controversial campaign against poachers. Articles in "National Geographic" magazine, television appearances, and the 1983 publication of her book "Gorillas in the Mist" (which was later made into a popular movie), focused world attention on the he Gorilla's plight, but gave her little protection from the hatred of the poachers. Mountain Gorillas are family creatures and live in groups from five to thirty-five members. 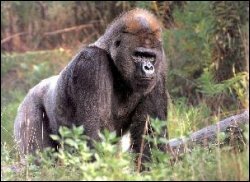 A silverback, the dominant polygamous male in the group, is the leader. 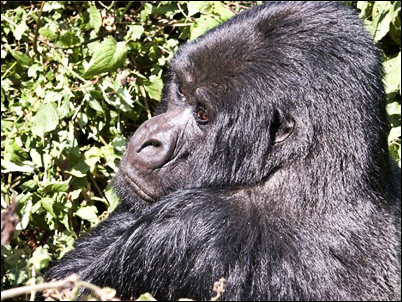 The groups include the silverback, several females and offspring. Females are reproductively mature at about 7 to 8 years, but do not normally breed until 10-11 years. Females will leave their birth group before breeding and join another group. Males normally do not start breeding until 15-20 years. Gorillas do not have a specific breeding season and females normally give birth to only one offspring at a time. Over a 40-year life span a female will normally bear 2-6 offspring. The females are nurturing mothers, who feed and groom their babies. Gorillas do not mind sharing activities, so it is not uncommon to see a silverback playing with the young or grooming them. All young gorillas are incredibly active and often pester the adults. Infants are normally weaned at about the age of three years. Mountain Gorillas are principally vegetarians, but occasionally eat small invertebrates. Naturally, mountain gorillas require large quantities of food due to their massive size. Surprisingly, they do not need water because they obtain enough from the plants they eat. 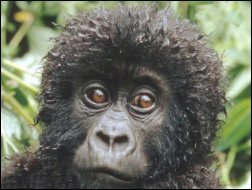 Over 3/4 of the mountain gorillas diet is shoots, stems, and leaves. 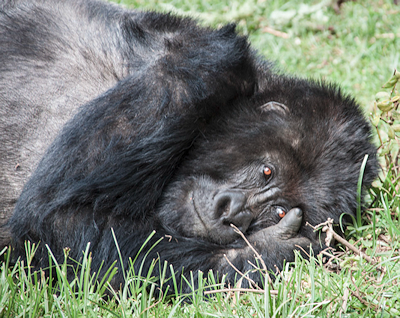 Gorillas spend about a third of their day feeding, a third traveling, and the remainder resting. They make nests to sleep and rest in trees, on steep slopes, or on the ground. Gorillas are usually very gentle creatures. Their only effective predators are humans. They are often thought to be "slow" or "dumb" because of their sluggishness, but in fact they are intelligent and capable of learning sign language. Gorillas are peaceful creatures and will only attack to defend their group. The Mgahinga Forest National Park covers the slopes of the three northern Virunga volcanoes and gives the park its name. The volcanic soils are full of lava rocks and the area is inhabited by more than half the world's population of Mountain Gorillas. About the same size as Bwindi, 330 square Km, Mgahinga is a high-altitude savanna woodland, with rich forests of bamboo on the slopes and dwarf heath vegetation found near the summits. As you walk along a forest path, you'll feel the cool shade of the trees, smell the rich blend of flowers, ripe fruits, damp soil. You'll see brilliant butterflies, hear the ever-present trickle of water and the calls of birds echoing in the depths of the forest. Bwindi Impenetrable National Park, which covers 331 square Km, is an exceptionally rich and varied ecosystem and is one of the most unique and important forests in Africa. The Park ranges from lowland to a moist tropical forest. It has remained a rainforest for millions of years, while most other African forest have come and gone through the ages. 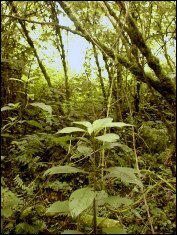 Thus, Bwindi has always been a refuge where forest species could survive. Bwindi is one of the richest areas in East Africa for birds (350 species), butterflies (310 species), and trees (325 species). The forest is home to at least 120 species of mammals, including ten species of primates. Bwindi is important to local communities -- it supplies the area with building materials, medicine, food, and clean reliable drinking water throughout the year. Its cultural heritage features the history, folklore and traditional healing practices of the local peoples. People from all over the world come to Bwindi to see the Mountain Gorillas, and while revenues generated through tourism are mainly used to maintain the Park, a portion is shared with people living in the area.